April 11, 2019 -- Dell Hoffmeister placed 1st out of 18 contestants at our Skills USA contest on April 5th. He scored 994 points out of 1100 points. He was scored on use and care of tools 100 out of 100 points, general safety 145 out of 150 points, layout of work(accuracy and best use of material 195 out of 200 points, Construction (accuracy of cuts, best use of material, filling of joints) 187.50 out of 200 points, Assembly (assemble according to plans,sequence of construction,overall appearance) 187.50 out of 200 points, General workmanship ( ability to follow plans, ability to follow written directions, quality of workmanship) 145 out of 150 points, PDP test 34 out of 100 points. He had to build a 4 sided building with a window opening in one wall and a door opening in another wall. He had to build a small gable roof on top of the walls. He will able to go to Skills USA Nationals in June. April 3, 2019 -- Thank you Mrs. Sellers once again for bringing the Salem Freshman Honors Students to Montauk. They are a wonderful group of young adults. I enjoyed talking with the students and answering their questions as we cleaned up the riparian corridor. I may have snuck in a few educational facts about the park, environment and life to add to their day away from the books. Education comes to us in many different forms. March 18, 2019 -- SMS 8th Grade Volleyball team wins 3rd Place in the St. James Tournament. March 13, 2019 -- The Salem Upper Elementary held a Family Reading Night on March 12, 2019. Our Read-a-Thon provided a chance for students to read with their parents and then show them how they take an Accelerated Reader test. We appreciate the parents that joined us and took time out of their evening to make memories. One of the comments on the feedback form from students was "I enjoyed spending time with my dad". This is what makes it all worth while. March 12, 2019 -- Salem R-80 art classes all participated in the local Art Across the Ages art show sponsored by the Salem Area Arts Council and the ONCRC. This show, for all ages of artists, is a celebration of Youth Art Month which is recognized during the month of March. March 11, 2019 -- Salem Art Club adding art in the community as they paint the children’s room in the ER at SMDH. ​February 8, 2019 -- The week of February 10 marks School Board Recognition Week. More than 3000 men and women serve in every school district across the state. These public servants serve in difficult positions that require tough decisions with no compensation or benefits. When school board members are out in public and on their personal time they will get the dreaded question, “Are you still on the school board?” That question is rarely followed with anything positive. Board members choose to serve and deal with these difficult situations because they want to make a difference in the community through our children. Board members serve to make decisions in an effort to provide our children with the best opportunity for a successful future. The Salem R-80 School District is fortunate to have seven board members that work tirelessly to fulfill these vital roles. Dr. Bernie Sirois, Mr. Dustin Howard, Mrs. Holly Erway, Mr. Drew Whitaker, Mrs. Carrie Snider, Mr. Chris Heavin, and Mr. Larry Maxwell currently serve on the Salem R-80 Board of Education. On behalf of the students and staff of the district, I would like to publically thank each of them for their service to the school district. Row 1 - Chrissie Warner, Emily Cunningham, Emma Schott, Alyssa Mayes, Kaitlynn Stephan, Kelsey Stienbarger, Jonithan Gallagher, Martin Jones, Taytan Barton, Jainey Pettus Row 2 - Elizabeth Cheney, Megan Watkins, Jaden Dunn, Toby Hutto, Kira Lacy, Harmony Alexander, Collin Hinderliter, Faith Jasper, Christopher McSwain, Stephen Lumley, and Johnathan Stark. On January 23, 2019 Salem Chapter of FCCLA attended STAR events (Students Taking Action for Recognition) and participated in Missouri Region 5 Officer Elections. We are proud to announce the election of Trinity Lewis as Region 5 Parliamentarian. Trinity will serve as the Parliamentarian for Region 5 for the 2019/2020 school year. She will conduct regional trainings at FCCLA State Conferences, she and the other officers will be responsible for putting on the Regional Conference next October and she will conduct the Regional elections next January. Trinity also serves as an officer in our local Salem FCCLA chapter. She is currently the Recreational Leader. January 4, 2019 -- Congratulations to the following Salem Middle School Band students for their selection in the Central District of the Missouri Music Educators Association Honor Band. These students will be travelling to Waynesville High School on Saturday, January 5, 2019 for an all day rehearsal and concert, which begins at 5:00pm. Clinician for this honor band is Mike Steffens, former band director at Lee Summit High School in Lee Summit, MO. Congratulations to these outstanding musicians. December 14, 2018 -- Back in my coaching days, I always reminded my players that they represent Salem everywhere they go. Their actions and behaviors will form perceptions in the minds of people in neighboring communities that will reflect on their hometown and on their school district. To me, building citizenship and strong character were more important than winning games. Now do not get me wrong, I enjoyed winning games as much as anyone, but I would rather lose with athletes displaying strong character than win with athletes displaying poor character. I am happy to say that in my four years as superintendent at Salem R-80 I have not received a single call from a neighboring district complaining about the poor character and citizenship of one of our students. Unfortunately, I have had a few calls about some unruly adult fans, but never about one of the student athletes. As I opened my email this morning, I was pleasantly surprised to find this message from a patron in another community. “I had to write to you about your students after I saw them today at Cracker Barrel on Hwy 44. My husband and I were eating a late breakfast this morning and we noticed several tables of teenagers. It was a pleasant surprise to see ALL of the students talking to each other instead of looking at their phones. When we left the restaurant side, the chaperones were still eating but there were about 10 students standing by the door. They were quietly waiting. One young man opened the door for us and when I asked where he was from he said Salem. You should be proud that they were respectful of the other patrons without having adults directly monitoring their behavior. I hope they enjoyed The Fox performance today. This particular trip was a large group of high school choir students attending a musical at the Fox Theater in St. Louis. They had stopped to eat at a Cracker Barrel on the way. That email made me smile from ear to ear. Those are the kinds of things I want to hear about when others come across our students. If you have a child that was a part of that particular trip, please let them know they represented their community and school with citizenship and character. December 7, 2018 -- It is that time of year once again. “A winter weather advisory is in effect for Dent County.” The ten words most every student loves to hear and the same ten words every superintendent hates to hear. The decision to close school due to weather is one of the most difficult and stressful decisions school superintendents have to make. Even though they may not agree, students need to be in school as much as possible. The goal is to have the doors open and education taking place each of the 174 days on the school calendar. When travel becomes dangerous, however, the focus turns to safety. Safety for the kids on the buses, safety for our staff, and safety for the nearly 200 high school students that drive each day. With some winter storms, such as ice storms, the decision is very easy. Other winter weather, such as only an inch or two of snow, are much more difficult. The interesting dynamic with our school system and with the Dent County Schools is the process we use to decide if school is going to be closed or not. Because the four K-8 districts feed into Salem High School, it is important that we are all open or closed at the same time. Granted, we are five separate districts that are autonomous of one another, but decisions have to be made as a group to do what is best for all of our students. Each district gets a vote on whether to close school or remain open due to weather. If two of the five districts vote to close school, then all five districts typically call off school. It might be very possible that a home in southern Dent County will have nothing on the roads at all and a home in northern Dent County could have ice, sleet, and snow. In this case, typically all five schools would be closed. It is very common for the roads in town to be clear of snow and ice, but the county roads have not been cleared. This is especially true of rural gravel roads that do not get much sunshine during the day. In this instance, school will be closed because the county roads are still dangerous while the town roads and highways may have been clear for a day or two. Our city, county, and state road and highway departments do a great job of getting our roads ready, but with thousands of miles of county roads the buses travel each day it takes them time, especially if Mother Nature is working against them. When winter weather is forecasted, the superintendents and transportation officials from each of the five districts begin checking the roads about 3 am. If the decision is made to not have school, information is typically sent out around 5:30 am. Each district has an automated phone system and information is sent to area television and radio stations. This is never a decision that is taken lightly and is often the source of a great deal of stress and second guessing. It may not be a perfect system that is utilized in Dent County, but it is one that has worked for years and continues to work. 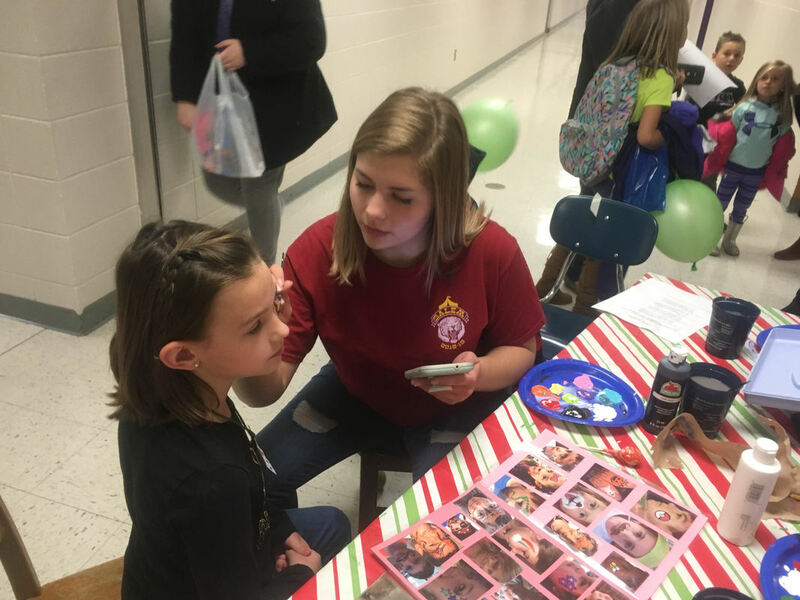 December 6, 2018 -- Students from Salem Upper Elementary participated in "The Great Holiday Bake Off" on December 4, 2018. The students presented an old fashioned bake-off with characters playing the parts and the students' songs matching every baker. December 5, 2018 -- The following students have drawn images from around our county representing the beautiful Ozarks in which we live. These students have spent many hours drawing and putting together a calendar featuring 20 of our best drawings. Please feel free to contact one of these students, or Mrs. Kettner, if you would like to purchase one for $10. It makes a perfect gift for that hard-to-buy-for person who appreciates something handmade! December 4, 2018 -- The Life Skills at Salem High School is designed to develop, strengthen, and improve skills for positive academic performance and achievement. Through content area course work, pre- and post- teaching, cognitive learning strategies, learning centers, organizational and study skills, test taking, and the enhancements of written expression. Self-advocacy skills and transitional planning are also part of the instructional program. The primary goal of this class is to empower students with skills needed to enhance their life and becoming as independent and successful as they can. This year we are excited about a new program that we implemented, Tiger Fuel. Tiger Fuel is a coffee shop that is ran by the high school life skills class during first hour. This program helps prepare special needs students for the workforce. They work on soft skills such as, communication, self-image, respect, and teamwork. They also, learn hard skills such as, measuring, prep work, clean up, order accuracy, and money transactions. Tiger Fuel delivers a range of hot beverages from, hot coffee, several different hot teas, and hot chocolate. Teachers have a choice of different sugars and creamers to add to customize their drinks. On Friday’s the class offers a little extra treat for our wonderful staff by selling muffins. These muffins are baked by the students the day before and are delivered alongside their beverage on Friday morning. Tiger Fuel’s crew wants to thank all the staff who support our program and we promise to keep delivering you a wonderful product with our friendly service. Special Olympics is off to a great start again this year. We had our Unified Bowling Event in Rolla on October 25 and we walked away with gold, silver, and bronze medals. We have other events in the future which include, Bowling at Ft. Leonard Wood, Unified Basketball at Laquay, and two Unified Track and Field events in the spring at Waynesville and Sullivan. Unified Sports are one of our favorite events in which we participate. Unified Sports joins people with and without intellectual disabilities on the same team. It was inspired by a simple principle: training together and playing together is a quick path to friendship and understanding. We have a great group of Unified Partners ranging from 9th grade to 12th grade. These students do an amazing job working alongside the athletes. Miss Simms and I are proud of our athletes, Unified Partners, and looking forward to this year’s events. Lastly, I want to thank Mr. Anderson for allowing us to venture into our new program, Tiger Fuel and to the staff who support us with their orders. Thank you to all our staff and students supporting and encouraging our Special Olympics team. Also, a big thanks to the Salem community and their support in both programs. We have had several items donated as well financial support from Dent County Disabilities Board, Salem Daily News, Walmart, Country Mart, McDonalds, and Classic Design Embroidery. November 26, 2018 -- A sneak peak at this year’s Trees and Trains entry! This year we collaborated with the Upper Elementary and Middle School art clubs to make a circus themed tree! All the students did an amazing job with the ornaments! You just have to come and see the creativity! The show opens Sunday Nov. 18 and runs through December! Photo: Three exhausted but happy art teachers; Angela Dingess, Sally McColloch, Tana Kettner. November 14, 2018 -- Salem Upper Elementary hosted a Science Night for students and parents on November 13th. The event had students and parents building balloon cars, creating domino trains, and making airplane gliders! November 12, 2018 -- The Salem Quiz Bowl Team started the season with a First Place win at the Houston Invitational Tournament, Saturday, November 10. Salem played nine games and was undefeated in eight. Two Salem players earned individual medals. Individual medals were awarded to the top ten players. Katrina Parks, junior, took home the Eighth Place Individual medal. Arley Gale, senior, took home the Fifth Place Individual medal. Also playing for Salem were Martin Jones, sophomore, and Nate Darby, freshman. “The team did a fantastic job since Arley was the only returning varsity player. Katrina has played some varsity, but Martin has only played jv, and this was Nate’s first high school tournament ever,” reported coach Susan Sheeley. Salem played Game One against Sullivan High School, devastating them 280 to 10. Salem next played Clever High School winning 240 to 40. Game Three Salem had more competition against the Houston home team, but won 180 to 100. Salem then continued the roll with a win against Weaubleau High School 170 to 40. Game Five Salem played Parkview High School and won 250 to 30. Salem took on Fatima High School in Game Six, which was a little more challenging, but Salem won 210 to 150. Game Seven saw Salem’s first defeat as the team played Kickapoo High School with a loss of 230 to 270. Game Eight Salem came back to defeat Ava High School 220 to 190. Game Nine Salem played Thayer and easily won 290 to 40. At the end only Salem and Kickapoo each had only one defeat, however, Salem had accumulated many more game points and so took First Place with Kickapoo taking home Second Place. Saturday, November 17, Salem will host its annual home tournament. The teams are coached by Susan Sheeley and Will Hubbs. November 2, 2018 -- Regular attendance at school is vitally important for a number of reasons. First and foremost, students who attend regularly are more likely to be successful by keeping up with lessons and assignments and therefore being more prepared for tests and quizzes. Regular attenders have a greater likelihood of passing math and reading assessments as these skills build daily. Students who attend daily qualify for more scholarships and have more opportunities to be a part of the school community. Secondly, regular attendance at school builds habits of being on time and being at work. Employers look for employees who consistently show up for work and are there on time. It is important for students to start building this habit at a young age and continue that habit during their educational career to prepare them for the workforce. Attendance is also important to school districts for reasons other than those already discussed. Each year school districts in Missouri receive a report card on their performance. The grade each school district receives determines their level of accreditation. Part of that grade is based on student attendance. The goal set by the state is for districts to have 90% of their students attending 90% of the time for the entire school year. Each student in the district is counted individually toward the final percentage. Last year the district ended at 89.3% for its 90/90 target with the actual attendance rate of 95.28%. The two previous years the district had 91.8% and 89.7% for the 90/90 and 95.07% and 95.83% for actual attendance rates. This school year the district is currently at 94.57% for its proportional attendance rate. Only a few students above or below the 90% line will go a long way in determining state accreditation. State funding for school districts is also driven by attendance. Missouri uses what is called the Foundation Formula to determine how much state funding each district will receive. This formula is driven by student attendance. The more students a district has that attend school each day, the more state aid that district will receive. The more students who consistently miss school, the less state funding a district will receive. If state funding declines due to lower enrollment or poor attendance, the more local funding will be required to replace the loss of state funding. Regular attendance is crucial to students, districts, and the communities for a number of reasons. The Salem R-80 School District continues to make regular attendance by students, teachers, and staff a high priority. October 29, 2018 -- The Salem Marching Blue traveled to Reeds Spring, MO on Saturday October 13th to compete in the Ozark Mountain Marching Festival. In class competition, the students were up against bands from Harrison, Cassville, Smith-Cotton HS (Sedalia), St. James, and Trenton. SMB students persevered through wet weather and chilly temperatures to bring home a 2nd place finish in class competition, just behind the band from Harrison, Arkansas. The band qualified to perform in Finals competition, but it was canceled due to rain. SMB students wrapped up their competitive season on October 20th at Francis Howell North High School in St. Charles, MO. Students once again fought through the elements of over 20 mph winds and gave an outstanding preliminary performance that earned them 1st place in class competition. With two 1st place finishes and one 2nd place finish on the season, the Salem Marching Blue represented the school & community in outstanding fashion and they have raised the standard for future bands at Salem R-80. The band would like to thank the band booster organization, band parents, SMB corporate sponsors, as well as the teachers, staff, & administration at Salem R-80. Our success is a testament to your continued support and commitment to set the standard for music education in Missouri. October 8, 2018 -- On Friday, October 5th, 57 Salem Senior High students were presented with their ACT Incentive Checks. For several years, Salem Senior High has encouraged its students to increase their ACT composite scores. The checks given out today were for the on-site April ACT test. Students earning a composite score of 22 or higher were presented with $50 (unless they already have received their $50 for a previous test), $25 for a composite of 17-21, $100 for the top score out of everyone that took the test on that date, and $50 for the next top five scorers from that date. All of the money comes from the ACT incentive account which is funded by businesses advertising on the electronic sign outside the high school. According to Assistant Superintendent John Smith, “We are changing the incentives for this year with even more money going to our students.” With more money on the line, expect to see even more students cashing in on their success. The Salem R-80 School District is seeking to purchase and is accepting bids for 350 - ASUS C202SA-YS02 4GB Chromebooks and 350 Chromebook Management licenses. The Chromebooks will be received on or before the end of June 2019 with payment finalized in July 2019. Bids must be submitted to the Administration Office no later than 3:00 p.m. on April 17, 2019. All Bids should be marked “sealed bid”. The board reserves the right to reject any and all bids. Bids should be mailed to Salem R-80 School District, 1409 West Rolla Road, Salem, MO 65560. For more information, including exact specifications, email chromebook@salemr80.org or call 573-729-5080. March 17, 2019 -- We would like express our appreciation to Keith Inman and Inman Insurance LLC for purchasing a washer and dryer for the Salem Upper Elementary. This purchase will allow our Life Skills class to learn the basics of doing laundry, as well as, being able to clean students' clothing, if a mishap has occurred. March 12, 2019 -- Our students started practicing for the Skills USA district contest that took place on Feb. 22nd right after Christmas break. We had to have an in house contest because I had 4 students that were interested in competing but could only take 2 students to the contest. After the in house contest I asked the 2 students that won how often they wanted to practice, they said they wanted to practice 2 to 3 times a week and they even came on a couple of Saturdays. We would practice for 2 to 4 hours in the evening after school. The students even came in on days that we had gotten off for snow days. They really put the time in and wanted to be ready. The day of the contest I could not have been more proud of my students. They had a good day and it showed. There was 12 contestants total from different schools. There were 5 students out of the 12 that got finished with the project. My students were 2 of the five. I could not have been prouder of them both for completing the task at hand. The time and effort that was put forth in practicing, to get better and better really paid off. It shows how dedicated they both were in competing in this contest. At the awards ceremony on Feb. 27th they gave out awards for the top three places. Dell Hoffmeister who is a junior in the construction 1 class this year placed 1st in the skills contest. At this time I don't know where the other student placed but as I mentioned both students finished their project. We also had a district written contest in January for Skills USA. There are 7 schools in our district and they send as many students as they want for each program to take the written contest. Jay Busbey who is currently a senior in my construction 1 program this year placed 3rd in the written contest out of 50 to 75 other students. Both Dell and Jay now get to go to the Skills USA state contest that will be held on April 4th, 5th, and 6th at Linn Tech in Linn Missouri. Both Dell and Jay did a fantastic job on their projects and written contest and I wish them both luck at the state contest in April. March 11, 2019 -- Congratulations to the following students who were accepted into the Young Artist Showcase in St Louis. Out of over 400 entries less than 200 were accepted! This outstanding show will be open until the end of March at the St Louis Artist Guild if anyone wants to go see it! Artists: Rachel Counts, Kullen Myers, Scilar Gibbs, LeighAnn Pope, Isabelle Knaack, and Madi Keith. February 25, 2019 -- The middle school A and B teams placed first and second place in the Salem Middle School Quiz Bowl Tournament that was held on February 12. A team members are Thomas McDonald, Andrew Smith, Eli Brakensieck, Bailey Howard, and Corbett Ball. B team members are Alana Lilly (not pictured), Christian Frederickson, Marshal Gollaher, Aurora Melson, and Kaison Wilmont. There were a total of five area schools competing with a total of six teams. January 24, 2019 -- Congratulations to senior Scilar Gibbs for having her white charcoal drawing “Autumn Daze” selected to represent our Senate District 16 in the 2019 Senate Hallway Exhibition. Artwork will be displayed by the 2nd of February through the end of the year. Scilar will be recognized at an awards ceremony at the state Capitol on Monday, March 11th at 11:30 am. ​January 18, 2019 -- The Salem R-80 School District is in the process of developing a long-range facility plan. The district has historically been fairly reactive when it comes to facilities. Facility needs were typically addressed when there were issues, such as leaking roofs or HVAC problems. The goal of the facility plan is to become more proactive. The facility planning committee had its initial meeting in November. We are currently working with a construction management firm to conduct an assessment on all of our facilities. They will look at all of our systems, buildings, athletic facilities, and roofs to provide information on life expectancy, condition, and other information to help the committee make priorities. The possibilities are wide open, but we need input from the community. These facilities are for our children, but they belong to the community. What are the community’s top priorities for district facilities? That is the question the committee needs answered. We have many needs across the district. We have athletic facilities that have not been updated in years. We have a weight room and locker room facilities that are at the end of their life expectancy and not in good condition. We have a 100-year-old elementary building that is very expensive to maintain. We have HVAC systems that are nearing 25 years of service. The committee’s job will be to place these needs, and other needs I failed to mention, into priorities. What priorities should we address year 1, what priorities will be addressed in year 2, and so on? Once we have an idea, I can work with the Board of Education to plan annual funding mechanisms for the identified projects. The facility planning committee will meet again after the facility assessment is complete. The committee will tour all of our facilities to help identify priorities. There are two ways that you can get involved and provide input. The first way would be to serve on the planning committee. Dates and locations of the next meeting will be announced on the district website and in the media. The second way to get involved is to respond to a facility survey. A facility survey is being developed so all stakeholders have the opportunity to provide input. If you have a student in school, a survey will be sent to you electronically. If you do not have a student in the district, a survey link will be available on the district website at a later date. The goal is to have a plan in place to take to the Salem R-80 Board of Education in June. Please feel free to give me a call at 729-6642 if you have questions or would like to be a part of the planning committee. ​January 14, 2019 -- It is already time to start planning for the 2019-2020 school calendar. The process of building the school calendar is a coordinated effort between Salem R-80, Oak Hill R-1, Green Forest R-2, Dent-Phelps R-3, and Northwood R-4. Due to the fact that the majority of the K-8 students in the county attend Salem High School, it is important that each district have the same calendar. We also have to take into consideration the calendar that Rolla follows because we send over thirty high school students each day to their RTI/RTC program. If Salem High School has a different spring break than Rolla, those students would miss two complete weeks of classes. Missouri statute 171.031.1.RSMo directs each school board to annually prepare a calendar and lays out the requirements and minimum standards for each calendar. Each calendar must provide at least 1044 hours of instruction and such plan must include a minimum of 36 weather make-up hours for possible loss of attendance due to inclement weather. A school district may be exempt from the requirement to make up school lost or cancelled due to inclement weather when the district has made up 36 hours and half the number of additional lost or cancelled hours up to 48, resulting in no more than sixty total make-up hours. The calendar for the Dent County schools builds in the 1044 hours of instruction over 164 days and then adds in 60 make-up hours over 10 days for a 174 day calendar. By choosing this option, all weather related make-up days are already built into the calendar and the requirements established under 171.031.1.RSMo are met. This option protects scheduled breaks, including spring break, and establishes the last day of school in May. Days will not need to be added on to the end of the calendar due to inclement weather. Families can plan trips and vacations knowing breaks are protected and the last day of school is not going to change. The proposed 2019-2020 calendar has school beginning on August 15 and ending on May 15. There will be a calendar hearing during the regular Salem R-80 Board of Education meeting on February 21st at 6 pm. A well-rounded education for our students extends beyond the school walls. Community partnerships help our students develop career skills that are difficult to teach in the classroom. In response, Salem High School has entered into its third year of the Internship Program. The Internship Program helps students connect the dots between work and school and empower them to visualize college and career pathways. Juniors and seniors can enroll in the Internship Program and receive credit as they are matched with possible career choices. This school year, there are 34 students enrolled in the Internship Program. This is up from 13 students that were enrolled just last school year. January 4, 2019 -- Meaningful internships can make a world of difference for our students. They empower students to do meaningful work that allows them to problem solve, work as a team, see their contributions in tangible products or services, and build relationships with mentors and colleagues. Internships teach students soft skills and help them gain exposure to different types of career choices they may choose from in the future. Internships are only possible thanks to our great community partners. The following business have partnered with the high school to accept interns over the past three years: Salem Memorial District Hospital; Chilton Oil; Missouri Extension Office; Ridge Runner; State Farm; Mercy Clinic; Salem Public Library; Reary Chiropractic; Andrew Curly, Prosecutor; City of Salem; McCoy Vision; Larson’s Automotive; Healthy Dent County; Country Mart Business Offices; Salem Care Nursing Home; Hubbs Tire; Cornerstone Chiropractic; Elwood Realty; Century 21 Real Estate; Riverways Credit Union; KSMO Radio; Tim Smith Auto; Everything Cinema; Ozark Dental; Progressive Ozark Bank; Town & Country Bank; Salem News; Amber Duncan Chiropractic; Salem VA Clinic; Farm Bureau; and Inman Insurance. Many of our business partners have also offered after school employment to their interns and others have qualified for the Flex Program to use their internships as places of employment. High school is a critical period for students to start exploring what they enjoy, identify their career goals, and map out a plan for their future. A successful Internship Program is another tool to help our students achieve their goals. December 7, 2018 -- Salem Middle School 8th Grade Boys basketball team took 2nd place in the Northwood R-IV tournament. They lost a hard fought title game to Phelps County R-3-Edgar Springs, 34-31. December 4, 2018 -- The Family and Consumer Sciences Department has settled into a productive year. The freshman class, Career and Family Leadership, is currently working on a Personal Finance unit. Working with a teacher created workbook and the Banzai computer program, they are getting a glimpse of life outside the classroom. Hopefully, this will give them a strong foundation for the Personal Finance class they need to complete to graduate. Since the first day of the semester we have talked about “making a family of your own” and the responsibilities and joys they will encounter. The class is structured to keep them thinking about the fact that someday…not too far in the future…they will each be the head of a household. We strive to learn how they can make the best decisions when that happens. Child Development is busy making educational toys at his point in the semester. Parents can be proactive when it comes to the development of their infant. We spend a lot of time discussing why and how that happens. Skilled Cooking is headed to the big week-long cooking marathon. The last week of the semester, we cook four recipes and create our own waffle recipe for day five. We try to have everyone in the class hands on cooking as much as possible. It is exciting to talk about what makes things rise and then to see it happen the next day. We hope that everyone enjoyed our shortening testing lab with the 5 types of cookies. The students are always very mindful as they evaluate the taste, texture and appearance of the cookies made with different types of shortening and shortening substitutes. FACS is an exciting area to teach and hopefully the students feel that way about being in the classes. There is nothing better than when a student contacts me years later and tells me that they are using what they learned in my class. FCCLA…Family, Career and Community Leaders of America…has been busy this semester. Service projects such as cookies for the new staff and the canned food drive along with fundraising, tie dying shirts and the Christmas parade, we seem to be busy every week. We are always looking for service projects to help the community, so we hope to stay busy. November 26, 2018 -- The Salem High School Quiz Bowl team continued to accumulate trophies with a Second Place Varsity win and a Third Place JV win at the Salem Invitational home tournament, Saturday, November 17. Five Salem players earned Individual Medals. The tournament is composed of three pool play games in the morning, then semi-finals and finals after lunch. Varsity was undefeated in the morning play. Game one, Salem played Borgia and stayed just ahead at each quarter, winning 190 to 160. Game two, Salem won easily over the St. James team winning 250 to 100. Game three, Salem played against Helias Catholic B and won 240 to 100. This meant that Salem finished undefeated and was seated second behind Helias A also undefeated for Semi-finals. Meantime, the Salem JV team played game one against the Helias Catholic A team, which won against Salem B 400 to 50. Game two Salem JV came roaring back and took St. Clair, 120 to 90. Salem JV then met up Helias B for game three and took revenge, 240 to 60. Semi-finals saw the Varsity team again play Helias Catholic B, seated third. Salem beat Helias again, this time 200 to 140, which set the team up to play finals against first seated Helias Catholic A. Salem JV, seated third played second-seated St. James in Semi-finals. Unfortunately, St. James won 180 to 110. Salem B would then play St. Clair for third place. Salem played Helias Catholic A in Finals taking the Second Place trophy with Helias taking First Place 280 to 210. Salem JV won their Finals match against St. Clair 210 to 150 taking the Third Place trophy. Five Salem players won Individual Medals: Arley Gale took the Second Place Individual Varsity medal, Katrina Parks took the Third Place Individual Varsity medal, and Martin Jones took the Seventh Place Individual Varsity medal. Nate Darby took the Second Place Individual JV medal and Ashton Hafner took the Sixth Place JV Individual medal. Playing for the varsity team: Arley Gale, Katrina Parks, Martin Jones, Olivia Erway, and Emma Schott. Playing for the Junior Varsity: Jake Darby, Ashton Hafner, and Alyssa Stotler. The JV team played short since teams are usually made up of four players. The teams are coached by Susan Sheeley and Will Hubbs. The coaches and team want to thank all the great volunteers who made the tournament possible. November 26, 2018 -- The Salem Upper Elementary Tiger Choir performed their Veteran's Program on November 19th. The student's program was entitled "The Words We Live By" and it celebrated the United States of America and the Veterans who have served or are currently serving for us. November 14, 2018 -- September 12th a group of Salem High school students and teachers loaded a charter bus, courtesy of Walmart and Crystal Bridges Art Museum, to travel to Bentonville, Arkansas for an art experience to remember for a lifetime! Walmart, the owner of the world renowned art museum, offers grants for school groups and they paid for the bus and the cost of substitute teachers for the sponsors participating! When we arrived at Crystal Bridges at 11:30 am on Friday, September 12th, where they provided us with a sandwich luncheon before beginning our guided tour. We broke into two groups and were led by a museum tour guide to about 4 different pieces of artwork, to learn more about the artist and the techniques used. Following the museum tour, we were then allowed to do a self-guided tour and even walk the grounds on the walking trails which display many sculptures. There is a Frank Lloyd Wright home on the grounds, and we were able to tour it while we were there as well. Saturday morning, we enjoyed touring an exhibit at Life Church of a Chinese-American artist who lives in Arkansas. The artist paints portraits of Arkansans in everyday life activities from the perspective of an outsider looking in- Very impressive! Then our group enjoyed a hands-on watercolor workshop by artist Jeanette Hudgeons, a former fellow college art major and friend of Mrs. Kettner. Finally, we went to a cool t-shirt/print shop, and were given a personalized tour and demonstration on how to make screen-prints by the shop owner. The students participated in the making of a Salem Tigers t-shirt in their studio. We are thankful to Walmart for making this trip affordable for our students and for the experience that will be remembered for a long time. November 2, 2018 -- The Social Studies department is the midst of a busy time in the first semester, with many classes covering critical sections of the course. In American Government classes the students recently took US Constitution test. American History classes are in the middle of the World War I unit, which is timed to align with Veteran’s Day on November 11th. In World History, students are learning about the Enlightenment and all the news ideas and theories of that time period. The United States Constitution test is a graduation requirement at Salem High School and is built into American Government, which all juniors must take. The test itself consists of one hundred questions and is broken up over the course of four days. All of the students taking American Government in the first semester of the school year passed the test, clearing one of the many hurdles on the road to graduation. The rest of the semester the students will focus on the Missouri Constitution, the American Government EOC test, and their final exam for the course. In the American History classes, which is a sophomore level class, students are currently learning about WWI. During this unit the students will learn why WWI is considered the world’s first modern war, how it contributed to WWII, and the origins of Veteran’s Day. With Veteran’s Day fast approaching, learning about the sacrifices made during The Great War, students will develop a greater appreciation for the holiday. As freshmen, students are required to take World History. Currently the world history classes are covering one of the most significant time periods in human history, the Enlightenment. It was during this time in history that many of the core values the United States would later be founded on, such as the rights and value of the individual, a desire for religious freedom, and a growing interest in science and education began to take hold in Europe. Centuries later those beliefs remain the guiding principles of the United States and western civilization. Social Studies is a very broad content area, covering everything from government and history to psychology and sociology. There are many other major events and concepts for the students to learn the rest of the semester and school year, but the month of November happens to contain many of the most important concepts taught throughout the school year. October 19, 2018 -- The Salem R-80 School District is in the beginning stages of developing a long-range facilities plan. A long-range facilities plan can help the district meet current needs and prepare for the future. This involves a comprehensive process that evaluates how the current facilities support programs and the educational needs of students, staff and the community. The planning approach needs to include a balance of community members, staff, parents, and students. Each district faces unique needs and challenges that must be addressed. For the Salem R-80 School District, enrollment has remained fairly steady over the past five years. Facility challenges for our district are not necessarily related to enrollment growth or decline, but rather related to changing educational delivery, phasing out or repair of aging facilities, and community needs. The process will begin with an evaluation of our current facilities. A facility planner will be utilized to evaluate educational adequacy and facility conditions. Surveys will be used for the committee to receive feedback from the staff, students, and community members regarding needs and facility priorities. Once this information has been collected, the adequacies and inadequacies of facilities will surface. 1) Educational adequacy – quality of space, function, safety and security, square footage, grade-level configuration, program support, and space utilization. 2) Facility assessment – proper maintenance and operation of the building site and envelope, interior systems, mechanical and electrical systems, health and safety upgrades, physical-plant condition, and accessibility. 3) Operations and sustainability – energy efficiency, administrative and transportation efficiencies, and recurring annual operating costs. 4) Community impact – obtaining community feedback, community services, community needs, historical significance, and property values. 5) Implementation assessment – effects on school operations, time, cost, learning, and budget priorities. The product of a long-range plan is a living document that will be revised as priorities change from year to year. A long-range plan will provide the district direction in planning and allocating capital resources for future facility needs. The initial meeting of the facility planning committee will be on November 1st at 6 pm at the Salem R-80 District Administrative Office. Anyone interested in participating in this process is encouraged to attend. Please contact Superintendent John McColloch at 729-6642 or at john.mccolloch@salemr80.org with any questions. October 5, 2018 -- Salem Upper Elementary is proud to introduce our Little Share Library to our community. It was designed by our favorite art teacher, Mrs. McColloch. It is located in our north parking lot and is ready for you to take a book and leave a book for others.